The Jewel in the Crown: Can India’s Strict Liability Doctrine Deepen Our Understanding of Tort Law Theory? The evolution of tort law in former British colonies is not only fascinating; it also holds clues into the age old question of whether law or any discrete area of law can be universal. The exploration into doctrinal divergences and convergences is part of a larger quest: to capture the theoretical underpinnings of tort law and, in that process, discover the universal core of tort law, if there is one. For example, is the central purpose of tort law efficient resource allocation, corrective justice, or simply a compensatory system for wrongs? To answer these questions, theorists have generally considered tort law in relatively wealthy jurisdictions that have a fairly robust tort law system: the United States of America, Australia, Canada, and the United Kingdom. However, there is no perspective from a developing country. This article provides a perspective from one developing country, India. 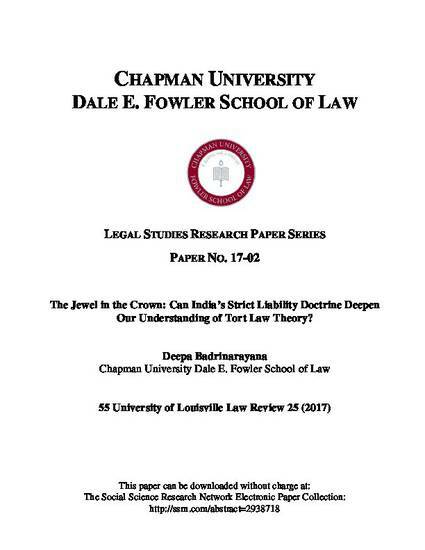 Deepa Badrinarayana, The Jewel in the Crown: Can India’s Strict Liability Doctrine Deepen Our Understanding of Tort Law Theory?, 55 U. LOUISVILLE L. REV. 25 (2017).